An epic battle is underway over one of the oldest super-hero roleplaying games, but sadly it won't be settled by muscle-bound men in tights. 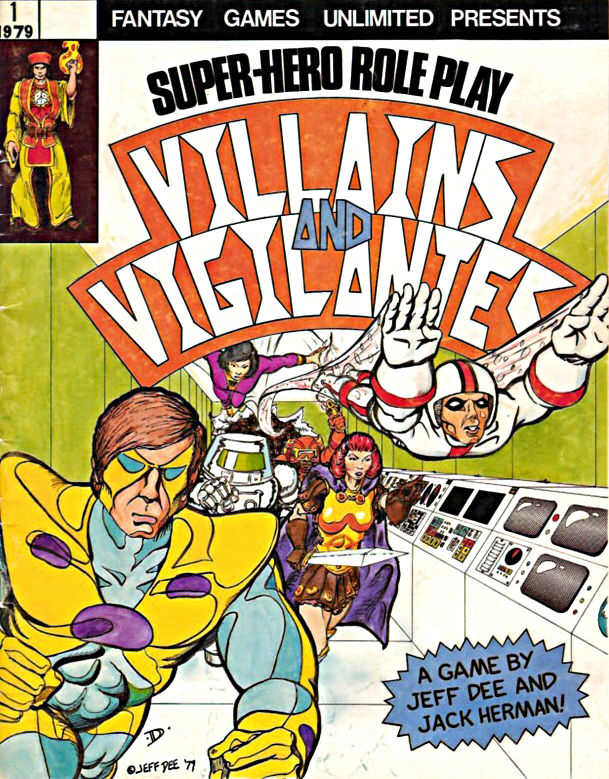 The creators of the game Villains & Vigilantes, Jeff Dee and Jack Herman, have filed a copyright infringement lawsuit against Scott Bizar, the longtime publisher of the game. The suit, filed July 27 in the U.S. District Court for the Middle District of Florida, claims that Bizar has no right to publish the game or any related products and illegally profits from their sale. 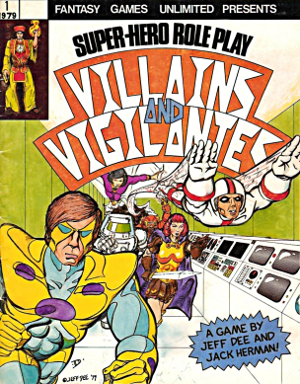 Villains & Vigilantes was created by Dee and Herman and first published in 1979 by Fantasy Games Unlimited, Inc., a corporation founded by Bizar. The game, one of the first to extend Dungeons & Dragons-style play into the super-hero genre, was popular in the early '80s and spawned a comic book series and other spin-off products. But by 1987, Fantasy Games Unlimited had run into financial difficulties with distributors and its business activity slowed to a crawl. We started to become unhappy in the late 1980s when FGU stopped advertising V&V, taking it to conventions, or even soliciting distributors. When it became clear that this situation wasn't going to change, we started looking for ways to get our game back. But for years, it looked hopeless. The contract seemed to give Scott Bizar enough loopholes so that he could keep it in force perpetually with little effort, and attempts to purchase the publishing rights from him were met by outrageously high price tags. Our contract was with Fantasy Games Unlimited, Inc. -- which, we recently discovered, was "dissolved by proclamation" by the state of NY in 1991 ... It no longer exists. And the contract clearly stated that if FGU, Inc., ever ceased to exist, then the publication rights reverted back to us. Bizar's a high school teacher in Arizona who kept his old games in print and ran a game store in Gilbert, Ariz., that closed in 2007. He told an interviewer in 2000, "My principal trade is now teaching not publishing. When you're over 50 and married with a child you cannot allow yourself the same delirious adventures as when you're 20 or 30. ... I no longer promise to fight as hard as I did in 1987, when the distributors refused to sell FGU products because they were not presented in boxes like TSR products." Dee's a game developer whose credits include the TWERPS and Quicksilver roleplaying games, the Warchest board game, and the computer game The Sims: Castaway Stories. In 2005, he released Living Legends, a super-hero game intended to be a sequel to Villains & Vigilantes. Herman's a writer published in comics such as Elementals, Robotech and Just Imagine and the computer games Ultima VI and Wing Commander II. For the past 12 months, both Monkey House and Bizar have been actively publishing and marketing Villains & Vigilantes and related products. Bizar's sole proprietorship, also called Fantasy Games Unlimited, has brought on new game developers. After Monkey House attempted to register a Villains & Vigilantes trademark on June 16, 2010, Bizar did the same a month later, leading to a case before the U.S. Trademark Trial and Appeal Board that began in March. The filing of this suit will likely cause that case to be suspended pending the result of litigation. Brent Rose, the Tampa attorney representing Dee and Herman, told me in email that the suit was filed after other means of resolving the dispute were attempted. "There were cease and desist letters issued by both sides," he said. "We requested arbitration or mediation or even just a teleconference to just try and work things out before filing our federal lawsuit, but our written requests were either ignored or refused." "Our contract was with Fantasy Games Unlimited, Inc. -- which, we recently discovered, was "dissolved by proclamation" by the state of NY in 1991 ... It no longer exists. And the contract clearly stated that if FGU, Inc., ever ceased to exist, then the publication rights reverted back to us." If true, then it's game over for Bizar and his friends. Give it back to Jeff and Jack! Seems the article has no quotes from either side. I would love to hear Bizar's side of the story, why 11 years ago he basically said "I don't want to do this anymore" but now he's spending tens of thousands on a lawsuit that a teachers salary can't afford. Is the game selling amazingly well? Did he change his mind about quitting now that he's 60+? I don't need lawsuit details about why he thinks he owns it, I just want to know why the renewed interest? Hey, Scott Bizar! You leave Jack Herman And Jeff Dee and Villains and Vigilantes alone! Who am I? I am DANGER WOMAN! In the name of good superheroes everywhere, I will right wrongs and give that bad man such a headache with my singing of The Theme From Villains And Vigilantes-Good Vs Evil! Prepare to get such a headache, Scott Bizar! That will be a hard lawsuit to win. State laws end at the border. Thus fantasy games might be protected from loss of control outside that particlualr state. Copyright is not a state issue, it's federal. @BIGBADBUG: Yes Copyright is a national and international legal issue, however the State of NY did not determine the copyright issue, it determined the continuity of the Corporation in that state. That decision ends at the state border. Of course you could argue that the company was registered out of that state but should it exist across multiple states, the copyright remains with the remaining company - even if it is a name located out of a village in mexico. @YELLOWDINGO: Thanks. Of course if the authors' claim is accurate, and the company was never reincorporated anywhere, then there is no 'remaining company' for the copyright to remain with, is there? @BIGBADBUG: Yet to be seen. Thats why we have seats in the jury box...so we can impose our own version of reality on the world. I've been holding a torch for V&V to come back and get going again for about two decades now. Its free-form creativity made the GM work more, but I liked the challenge and we came up with some inspired characters. When I thought Scott Bizar held the rights, I contacted him directly. I enjoyed the conversation, and hoped to see V&V return in force. Then when I found out Jeff and Jack were coming in - and they had the stronger claim, I was grateful - especially since they OFFERED others the chance to publish adventures and for ANY SAID PUBLISHER to keep their profits under simple guidelines, I was impressed. I thought it would be a no-brainer. Frankly, this FGU Publishing Explosion strikes me as a masquerade; a fight for a child that was neglected by her parent and who really, AFAICT, has no legal right to it. By running around and doing all this last-minute work, FGU seems to be trying to capitalize on a name they'd ignored and defend their publishing history, even though the corporation is defunct. I think enough is enough. If the judge is not a fool, he will see this as the tactic it is and will slice through it with reason. If not, I'm sure Jeff and Jack can find another name for the true heir to V&V. Who won the case? Can you please post an update. Download our design home app, and experience the joy of designing your own home.